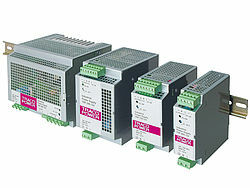 The TSP series power supplies are designed to work reliable also under critical factory floor conditions. The TSP series models come in a rugged metal case with shock and vibration proof construction. They feature high immunity against electrical disturbances and a high power reserve. The operating temperature range is specified from –25°C to +70°C. All models provide remote On/Off and alarm output. International safety approvals package includes ATEX 94/9/EC certification and IECEx test report for applications in hazardous locations. The new models of the TSP-WR series are featuring an ultra-wide input voltage range of 85 to 550 VAC. With this range the power supplies can be used in practical any single- or multiphase power network. Output specifications and configuration are the same as for the standard TSP models.